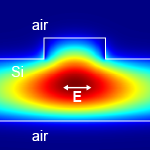 Authors: Li; S.; Kumar, G.; Murphy, T. E.
Abstract: The interaction of terahertz waves with silicon is usually explained using a linear model of conduction in which free carriers respond to the oscillating electric field, leading to absorption. Here we employ a silicon dielectric waveguide to confine and concentrate terahertz pulses, and observe that the absorption saturates under strong terahertz fields. By comparing the response between lightly-doped and intrinsic silicon waveguides, we confirm the role of hot carriers in this saturable absorption. We introduce a nonlinear dynamical model of Drude conductivity that, when incorporated into a wave propagation equation, predicts a comparable field-induced transparency and elucidates the physical mechanism underlying this nonlinear effect: velocity saturation—an effect that fundamentally limits the speed of most semiconductor devices. The results are numerically confirmed by Monte Carlo simulations of the Boltzmann transport equation, coupled with split-step nonlinear wave propagation. The results reported here could have significance in understanding and designing a variety of emerging and future terahertz devices, such as waveguides, mixers, detectors, and oscillators.